In the 2nd at Delaware, “HARDWIN was pulled up in distress…humanely euthanized” (Equibase). Hardwin was four years old and “For Sale” at $5,000 prior to dying. A short while later, “JUST ZIP IT collapsed and died at the finish line” of the 4th at Arlington. No surprise here: Just Zip It, also four, was running his fifth “maiden claiming” race. The previous four: a “distanced, DNF” his first time out; followed by last-of-11, 29+ lengths back; last-of-11, 24 back; 5th of 6, almost 10 back. Also, the NYS Gaming Commission has finally confirmed the death of 3-year-old Bay City Blues in the 5th at Finger Lakes Monday – “euthanized on the track.” On the chart, Bay City was a “broke down.” Like a car. And finally, also at Finger Lakes, this for Timber on Wednesday: “paralyzed arytenoids without resolution – euthanized.” Timber was four and had been under the whip 16 times, most recently in June at Belmont. These poor horses are just raced to death. Now they’re in a better place after their long ordeal. All just youngsters … and Just Zip It clearly had something wrong and yet they ignored it and kept going with the poor horse. Thanks for mentioning this. A bunch of us were there yesterday and we’re trying to recall if that was the horse that was resisting the starting gate. I don’t recall any mention of the news over the PA either. Just kinda moved onto the next race. SD, was Just Zip It balking at loading? Yes, SD, all just youngsters. Today I was sent a screenshot of a three year old gelding who is being networked in order to find him a home. He has raced 23 times and appears to be a “bit” body sore plus he sports small osselets in both front ankles. For those reading here, osselets are arthritic fetlock joints which occur from repeated concussive forces during racing or other high impact activities. Again….only three and already has arthritis in BOTH front ankles yet “we,” who are against horseracing, are accused of “hurting” the horses. Really? “We” hurt the horses? I suppose we need to stay positive since the gelding’s racing connections stopped racing this poor soul before he was totally destroyed. This Blog is being allegedly monitored from various powerful pro-horse racing agencies. Since you are reading these posts every single one of you who have the audacity to come on here and defend this carnage – you need a mental head check! You are all delusional, and to continue participating in this mayhem by subjecting a living being, a racehorse, whom you claim to “love” is so egregious it makes me vomit. Before I comment, know this: there is conflicting information coming from the powerful Woodbine CEO’s and their stupid public statements that they so often must release to provide public wallpaper for their little money making scheme at the expense of racehorses, and people. Darren, a 43 y.o exercise rider, who did gallop for me on occasion when I was training – DIED this morning! I’m told from sources that the wreck was the most horrific thing they have ever witnessed. 2 racehorses collided going full speed on the training track this morning at around 7 AM. Darren, I’m so sorry for you. You died in the dirt just like the racehorses do. This business is nothing but carnage, and mayhem for the racehorses and some of the people who work around them all for profit – all for a very small percentage of racetrack management/CEO’s/wagering companies to make billions in wagering profit including the HBPA! Of course Woodbine was quick to say that no racehorses were damaged, but I’m told otherwise. Their usual statements released like they are SO SORRY. Yea right, you are just sorry that the public had to find out most likely, because in earlier years this would all be hidden including the thousands of racehorses who have DIED on that track over the years, the people whose lives you destroyed for your stupid antiquated business model. I could be wrong, but they are not speaking to anybody, and since I no longer have anything to do with anybody there, thank goodness, I really don’t know. I do know that these racetracks are HELL HOLES for racehorses, and most of the people who work there. The people who work there have very little choices as to how they can make a living, and the racehorses have no choice at all. 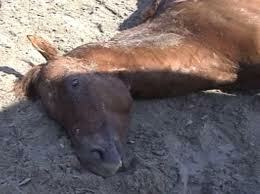 We also know that lots of racehorses are dying, and even 1 dying is totally unacceptable. I despise this business, and Woodbine needs to change their name because horses, and people DYING is NOT entertainment. Oh this blog is most certainly read, Gina. It is. And readers – for and against – will have plenty to read about until the day comes that this industry goes the way ALL animal-use-for-entertainment-purposes should go. Here’s another tidbit, just to put things in perspective. Exercise Riders (ER’s) are considered, almost always, freelance/independent contractors so they get paid BY THE HORSE, which is on average $20 per horse or less. So most of them gallop about 8 per morning hours to make $160. Compare this to the workers at SeaWorld – it’s no different. In the movie Blackfish lots of the truth comes out via the ex-trainers, and horse racing is very similar on all levels. When you are working around a 1200 pound UNPREDICTABLE racehorse that is,most likely, pumped up with performance enhancing drugs running all out at about 45 miles per hour your going to get hurt not to mention that most racehorses are completely stressed-out so they are reacting as a fright or flight animal does. It’s not IF you are going to get hurt it’s just a question of WHEN you are going to get hurt, and how bad it is. Dawn that got killed by Tilikum is a prime example, and Ken Peters who almost got killed. Just for the safety factor alone this business should immediately cease to exist because it’s inherently dangerous for both the racehorse, and the people who work with them. This business is all about exploiting a weaker species, and exploiting people whose choices are limited. This is all being conducted under an “entertainment” banner now. Well you are not fooling people like us because your stupid “entertainment” is racehorses, and people DYING. This is a VILE, despicable, repulsive, evil business and it has GOT TO GO!! Again, I’d like to thank Patrick for bringing this to the forefront for all to read. The owners, trainers, and jockeys make me sick, not only for the ungodly abuse these beauties must endure, but also their cavalier attitude towards the injured, dying, or dead ‘athletes’ they should be protecting. There’s a special place in hell for any and all who abuse/kill the horses…until that time drastic changes must be made.